When I first saw this I thought it was Eliton John if had been born with problems. 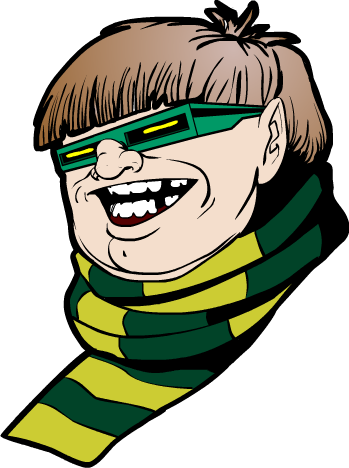 Its Mole Man. Kinda looks like Ock though, too. Illegitimate love-child of Doc Ock and Mole Man. Duh. It’s why he’s so happy — TWO sugar-daddies giving him presents every holiday. Son of OctoMole! At a soccer game! Y’know, Marvel is missing a bet by not marketing Mole Man glasses, Galactus hats, Mandarin rings, Thor helmets, pre-torn purple Hulk pants…the more arcane stuff. I mean, inflatable Hulk gloves are all very well, but I’d happily wear an Eye of Agamotto tie-tack any day. With Rings of Raggador cufflinks. spidercow2010: I kinda wish this was Facebook right now, so I could click the “Like” button right next to your comment. That would be awesome if they did that. @Gero: Totally thought the same thing! @spidercow2010: THAT WOULD BE FRICK’N AWESOME! !